When I look at this card, I think of the joy on the face of a child when they give a gift, something from their heart. It can be a drawing, something they have made, or a found object. We all may remember as children, picking flowers for someone we loved, and the feeling of expectation and anticipation, hoping our gift will be accepted with love and put in a special place. That moment to me is being in a state of grace both for the giver and receiver. The beautiful feeling captured in this card makes me think of the many opportunities we have to share everyday. We each have unique gifts and talents but even something as simple as a smile, a hug, a touch, a kind word, a prayer, an act of kindness, a thank you. January 19th is the National Day of Service here in the US. It inspires us to give not just only for the day but for the entire year. 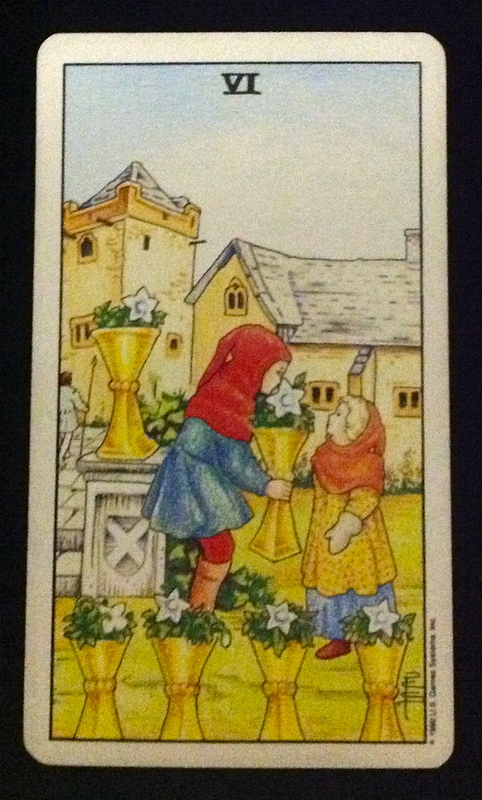 The Six of Cups, a day of service, a year of grace. This entry was posted in Tarot, Uncategorized and tagged grace, Martin Luther King Jr., National Day of Service, Sarah Ban Breathnach, Service, Six of Cups, Tarot. Bookmark the permalink. I love this card Maggie. When I read for people and this card comes out it can mean different things – maybe they will get a message or a visit from an childhood friend, or they will play together with someone. It could be that the client will have two children close in age – any number of meanings. I also love Sarah Ban Breathnach. I have several of her books. I love your blogs, they are refreshing and heart warming, just like you. Thanks Jean. I love Sarah Ban Breathnach too! I keep her book Simple Abundance near my desk.